Well we aren’t goin let that get us down! I ran down to my studio, which has run over into our rec room, and pulled out acrylic paints, that totally awesome extra wide, angle tipped black Copic Marker and some Foamcore boards. And happily got right to work! 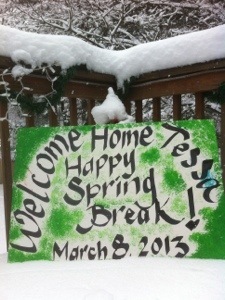 First sign is a welcome home sign for college freshman daughter who is coming home today for Spring Break… In the snow! 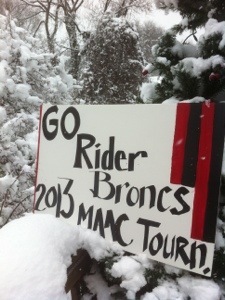 Second sign was made during the same painting fervor and is dedicated to our college Senior Son, a Digital Media/Sports Business Mgmnt major, who is going up this weekend to the MAAC Basketball Tournament on The Rider U Fan & Pep Band Bus. #1, as those of u who know him, is a consummate sports fan, especially re “the beautiful game of soccer”. He is also Student GM of RU’s radio station107.7 The Bronc! 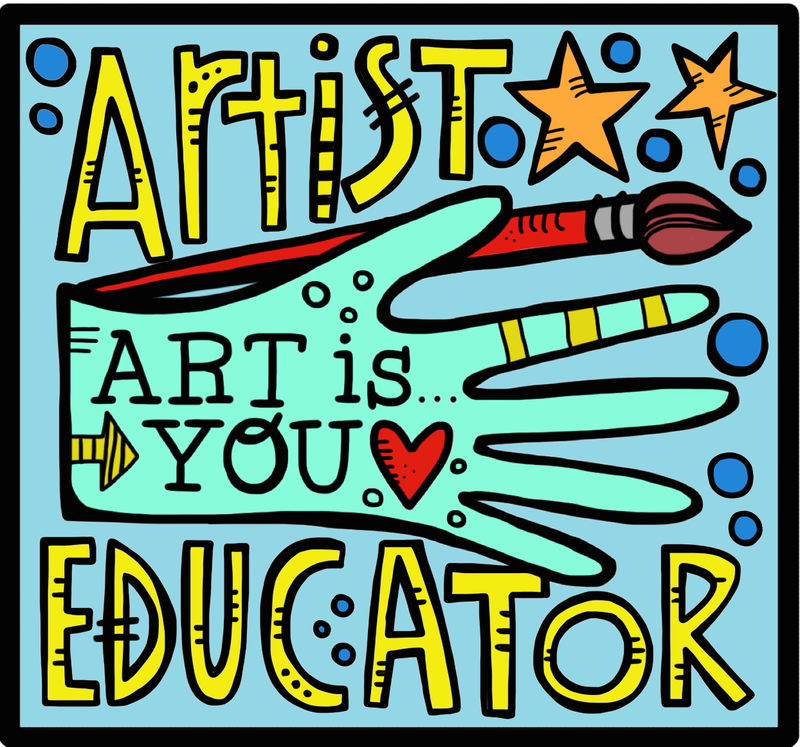 This is a nice break for the boy who is always working at the station either hosting/co hosting one of his 3 shows or producing/engineering local sports broadcasts…Remember dear followers he is job hunting! This past weekend I devoted most of Saturday to dying pieces of fabric, ribbon and baby onesies. We have a new Great Nephew and our neighbor’s have a new baby girl. One of my favorite handmade baby gifts is hand dyed baby undies ( T’s, tanks, onesies socks…). 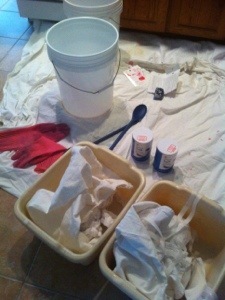 So I set up two dye baths (one Royal Blue n one Pink) using Jacguard’s I Dye Immersion Dye. Usually I am a Procion MX Immersion Dye devotee but was out of Activator, how did this happen?! 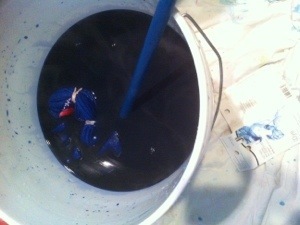 And fortunately had the packs of I Dye on the shelf to experiment with. I was not disappointed . 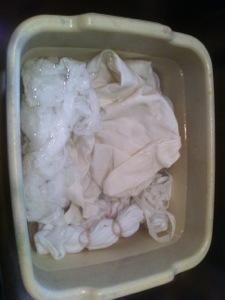 As with ProChemical’s (my fave supplier) MX, it’s always a good idea to prewash the goods to eliminate any sizing. 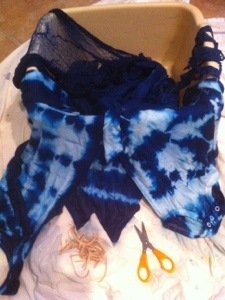 Then I bind up the onesies, Shibori style with rubber bands and then presoak in plain water just before the actual dying. In all the pieces went along with a cup of non-iodized salt in each bucket with enough hot boiling water to cover the pieces. 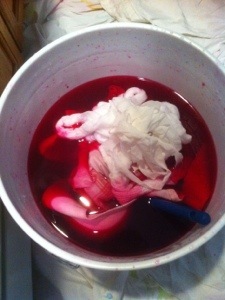 What goes on after that is a lot of babysitting!….stirring the contents for about 30 mins. Next is to remove all bindings, in this case the rubber bands (sometimes I use string, wood blocks, clothes pins, marbles…). Then into the washing machine it goes with some Synthrapol to set and clean and then a second cold water wash to remove any residue. So it’s not your traditional camp style tie dye! Here’s the Royal Blue bounty! The I Dyes give a very beautiful vibrant color! I will hand stamp some pieces and on the girlie ones add a touch of lace! Just love dying day! I remember doing this for my little baby girl n boy way back when!